Night vision is a major new feature for this camera, but Piper still lacks a number of features compared to some other DIY connected-home platforms on the market today. Update July 18, 2017: We have completely updated our review of the Piper NV. You'll find our new opinion of the product here. When we got our hands on the original Icontrol Piper in July 2014, we concluded that the security-camera/Z-Wave-hub combo had room to grow. The addition of night vision (a $70 premium over the original device, which remains available) is a good step forward for the hardware, but the Piper's true potential remains untapped. The night-vision camera looks nearly identical to the original. You get the same sleek design, the same great 180-degree lens, the same great array of sensors, and the same Z-Wave hub. The new camera works with the same app, and it integrated seamlessly with the two Pipers Icontrol had sent previously (the app can manage up to five Pipers). You'll only notice the difference when the soft red glow of infrared illumination fires up around the Piper's lens as it goes into night-vision mode. On the inside, the night-vision Piper packs a faster ARM processor and a higher-resolution 3.4 megapixel camera that delivers 1080p resolution. Curiously, the faster processor doesn't seem to be enough to power the switch over to night vision. The camera will switch automatically based on the ambient light, or you can switch manually between modes. In practice, I found that it favored day mode even in low light when some other cameras (such as the D-Link DCS-825L baby monitor I reviewed recently) would have switched to night mode. The Piper nv struggled with its switch to night-vision mode. When I forced the Piper NV to switch, it was very sluggish to update, leaving a long green screen and then a very pixelated picture for several minutes while the bit stream caught up. 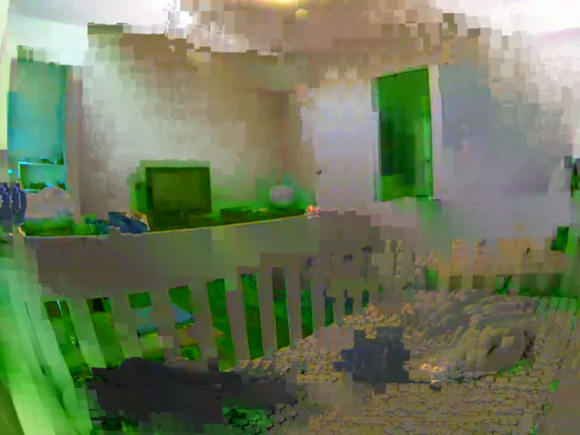 Parts of the image rendered clearly, but any movement turned into a pixelated mess, despite being set to use maximum bandwidth for local network streaming. Video from the regular cameras was still smooth, so it's unlikely my home network was throttling the Piper NV's video stream to such low quality. The software is so intuitive that my two-year-old was able to add a smart plug with minimal coaching. He enjoys turning a lamp on and off through the Piper app. I'm a fan of the home vitals tab as well, which shows stats per Piper, illustrating temperature and humidity differences between levels of our 100-year-old home. One of several errors I encountered on opening the Piper app. The app can use temperature alerts to control an air conditioner or heater plugged into one of the smart plugs to keep the temperature under control, but I wish I could have used the humidity levels to trigger a dehumidifier. 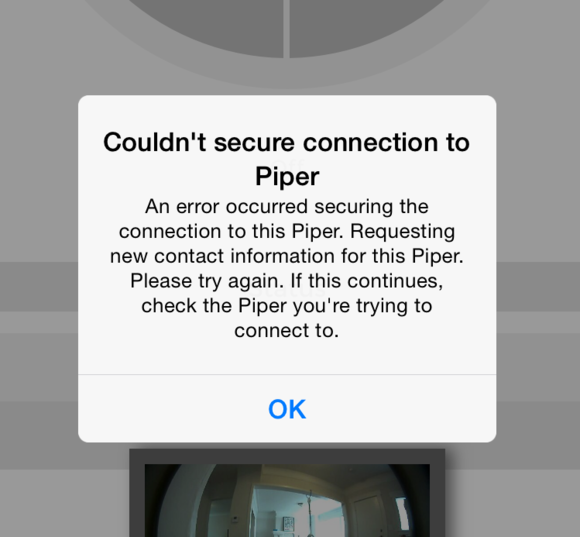 Sadly, the software frustrations covered in our Piper review from July are mostly still around. Alerts can now be dismissed by tapping the current mode on the dashboard, so there is now no need to change modes just to clear an alert. But there is still no way to save video. I also ran into connection issues. While my events list wasn't full of disconnect notices, I did spend a fair bit of time watching a spinning circle waiting for the app to establish a connection with the Piper, only to have it fail, then connect on the second try. That's a lot of waiting when a loud thud comes from the toddler's room during naptime and I want to know what caused it (it's usually just a cat jumping off of something). An example of the Piper's inconsistent picture quality. These shots were taken 5 minutes apart while nothing in the room was moving. I was frustrated by gaps in functionality while working in a multi-Piper set up. You can't create zones, for example. Every rule you define applies to every Piper in your network. If the Piper down in my garage detects motion, every Piper records video. What's even more bothersome is that if I wanted the garage Piper's siren to go off if a door/window sensor indicates there might be an intruder, the Piper in my son's bedroom will blast away, too. If you already own a Piper system and you're satisfied with it, the night vision that the Piper NV offers will be a worthy addition. If you're considering a Piper for the first time, know that it will let you control your home's lighting and small appliances, keep track of what's happening in and around your home, and it will monitor your home's environment. Beyond that, the Piper system is very limited—especially in comparison to some other DIY systems. Lowes' Iris product line, for instance, has expanded significantly in the two-plus years that it's been available and can now control or monitor everything from your irrigation system to your electric water heater (a re-review of the Iris system is in the works, by the way). The only Z-Wave add-ons that Icontrol officially supports on the Piper are smart plugs and dimmers, a smart switch, door/window sensors, and a Z-Wave range extender. It can't even control your thermostat. On the upside, Icontrol doesn't tack any subscription fees—optional or otherwise—onto the Piper's price tag. Still, if you're looking for a comprehensive connected-home system, you should make sure Piper fits all your needs before committing to it. 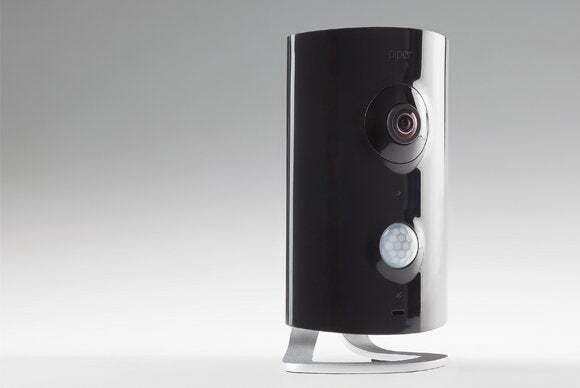 The addition of night vision makes Piper a much better security camera, but connection issues and app limitations should cause pause when considering it as the hub of complete smart home system.